In 1921 Charles William Paddock was widely acclaimed as the “fastest human being” in the world. In the 1920 Olympic Games in Belgium Paddock captured the gold medal in the 100 meter dash and won a silver medal in the 200 meter dash. One day Paddock visited a school in Cleveland, Ohio and spoke to the student body. A young black child listened intently as this famous athlete talked. “What do you want to be,” Paddock asked? You name it and then believe that God will help and you will become just that,” he said. That young man although materially poor was spiritually rich; he decided that he too wanted to be the fastest human being on earth. He shared his dream with Charles Riley his junior high track coach. Coach Riley said to him, “It’s great to have a dream son, but to attain your goal it is necessary to build a ladder to it; and on the ladder you must have rungs or steps that will support the weight of all you hope to achieve. 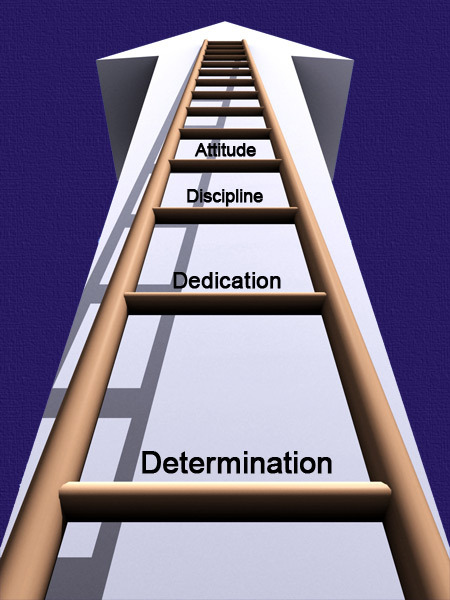 The first rung on your dream ladder must be determination and the second dedication. The third step is discipline! The fourth rung enabling you to build your dream is attitude!” To be successful you must decide exactly what you want to accomplish, and then resolve to pay the price to get it (Bunker Hunt). In order to succeed, we must first believe that we can (Michael Korda). The odds were against this young man. He was a poor black man who received no scholarship to college. He worked his way through school, training in the early morning hours because he had to work in the evenings. When traveling with his team he slept and ate in “black only” hotels and restaurants. He won a record eight individual NCAA championships at Ohio State University and was affectionately known as the Buckeye Bullet but he was not allowed to live on the college campus. In spite of cruel racial prejudice and abundant adversity; he persisted. In 1936 at the Berlin Olympics he won four gold medals. He made such an impression on Germany that even the Chancellor, Adolph Hitler, rose up and waved his hand at this great warrior. He was inducted to the Alabama Sports Hall of Fame in 1970; he was awarded the Presidential Medal of Freedom in 1976 by Gerald Ford and the Congressional Gold Medal by George H. W. Bush on March 28, 1990. In 1984 a street in Berlin was renamed for him. Two U.S. postage stamps have been issued in his honor. His name? Jesse Owens.